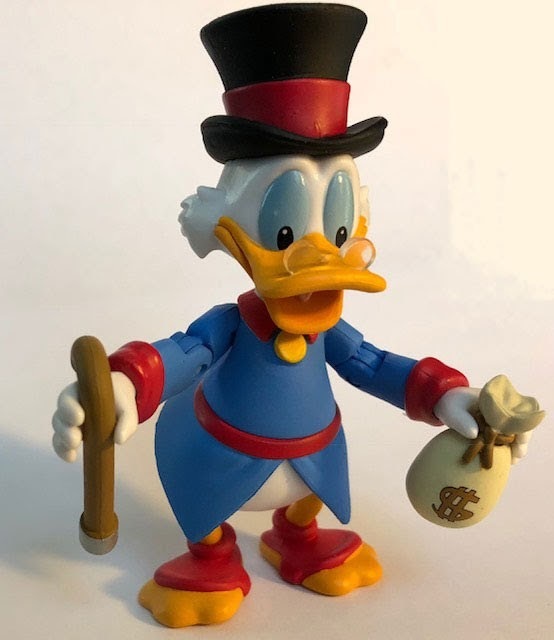 Here is a Scrooge McDuck action figure from Funko's Disney Afternoon action figure line. Scrooge is originally from the Donald Duck comic books and became famous to my generation from the Disney Afternoon DuckTales show. 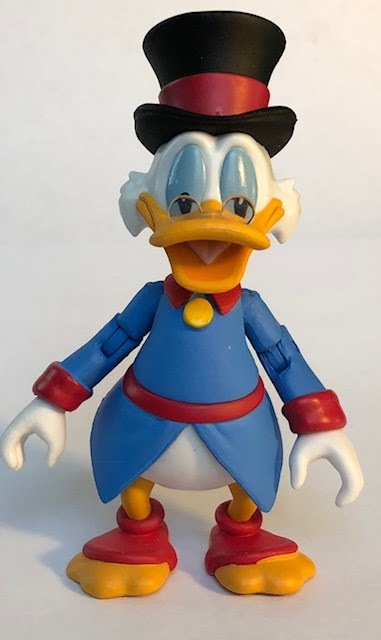 Wave 1 of this series comes with Scrooge McDuck from DuckTales, Chip and Dale from Chip N Dale Rescue Rangers, Darkwing Duck from Darkwing Duck, and Baloo from Talespin. DuckTales was my favorite show and of course, Scrooge would be the first released in this line which makes me happy. I'm looking forward to wave 2 to see who ends up in it from DuckTales. I like all the characters but I'm most looking forward to seeing Gizmo Duck. 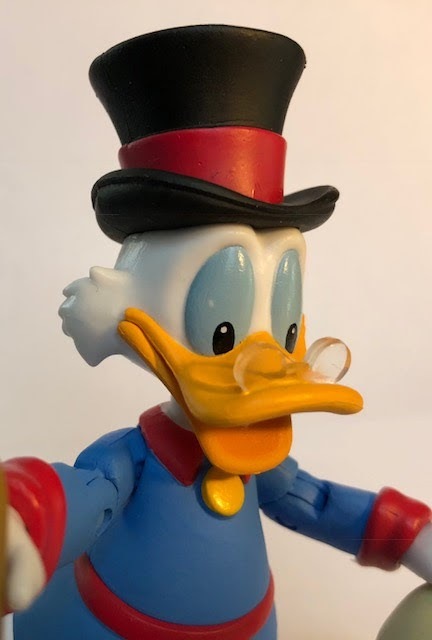 The sculpt of Scrooge's action figure looks great which has him wearing his classic blue coat, red spats, black top hat, and his glasses. It all looks very good and I especially like the way the glasses sit on his bill. 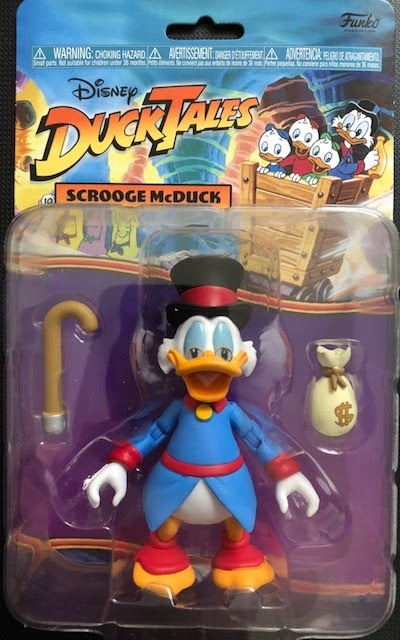 For a ten dollar action figure, Scrooge actually comes with two accessories, his cane and a bag of money. I like both but I've had a bit of trouble with the cane saying in his hand. I understand the money bag but I think his number one dime would have been a better choice as an accessory. 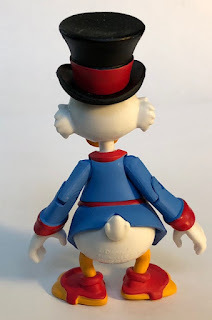 Scrooge has eight points of articulation including his head, shoulder and elbow, waist, and his legs. For the size of the figure, it's alright but I think he should have more like his hands. This Scrooge McDuck action figure stands four inches to the top of his head so he's not the biggest figure but to me, it seems OK because I always pictured the ducks in DuckTales would be shorter than humans but that's just me. Overall I'm very happy with Scrooge and I'm looking forward to collecting the rest of this wave. I'm also curious as to what wave 2 will contain. 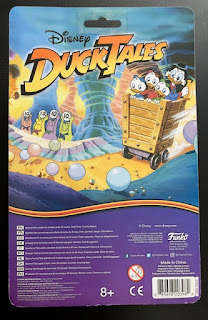 If you like toys and or DuckTales I suggest you find one for yourself before they sell out and cost too much. I give Scrooge McDuck from Funko's Disney Afternoon line an 8 out of 10.